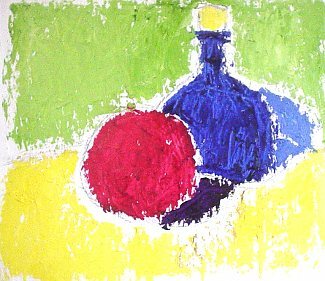 You are about to learn how to mix colors using a different approach. It's called 'full-color seeing', and it was inspired by Claude Monet and the Impressionists. They used this technique to achieve the luminosity of color for which they are so famous. 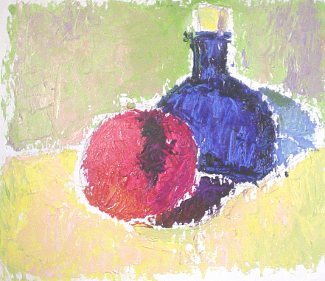 Today, this method is taught by Susan Sarback, an artist from California who traces her artistic lineage from the American Impressionist movement. Like many artists, when I first learned how to mix colors, I was taught the “tonal painter” approach. Since then, I have often felt that my colors were not as vibrant as I wanted them to be. Whenever I see the works of Claude Monet and the Impressionists, I'm enthralled. How did they capture the light? Why didn't my paintings have the same vibrant color and luminosity? Could I learn how to mix colors like they did? These questions prompted me to look for a missing link. Eventually I spotted a book by Susan Sarback and was captivated by the beautiful light in her work. I learned that her teacher, Henry Hensche, was a student of Charles Hawthorne, who was a contemporary of Claude Monet. Hawthorne was devoted to teaching Monet's way of seeing and painting colors. I realized that I could learn from Ms. Sarback how to paint like Monet—including how to mix colors the way he did. So, I bought her videos, went to her workshop, and learned everything I could. I came home with a different way of looking at colors that has truly enriched my artistic journey. My paintings now are more colorful and full of light compared to my earlier works (which used a predominantly muted earth tone palette). Below is a demonstration of how I use the “full-color seeing” method. It was my very first trial using this method with a palette knife. Scan the colors by looking past them in a relaxed way, rather than staring at them intensely. Paint with a painting knife, rather than with brushes. Mix colors on the canvas, rather than on a palette. Adopt a fairly large number of primary and secondary colors (both cool and warm), rather than painting from a limited palette. In her workshops, Susan taught us to break the process down to 4 stages. For clarity, I actually show more than that here. The first couple stages are fairly clear cut, but the latter part of the process can take as long as you want. In this case, I have the following colors in my palette: cadmium yellow medium, cadmium orange, rose violet, rose permanent, viridian, sap green, Prussian blue, ultramarine blue, and a lot of titanium white. The painting surface is an 8”x10” (20cmx25cm) gessoed board. I use a white surface to maximize the light that bounces off the colors. The initial charcoal sketch is wiped softly with a cloth. I quickly scan past my subject several times to get an impression of the colors in the largest regions of light and shadow...and their relation to each other. Using my painting knife, I apply the colors like I'm spreading butter. I want to avoid over analyzing, so when choosing colors, I go by the initial impressions I get form my quick scans. I can make adjustments later if I have to. 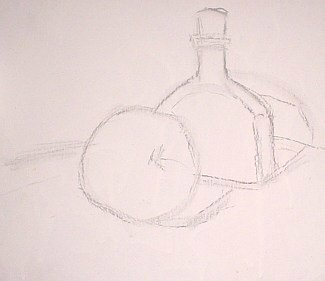 I want to keep everything loose, and I leave the edges of each adjacent shape open. Learning how to mix colors this way, I do not work too tightly later or else I end up making muddy colors. This is the crucial stage for setting the painting on the right path. At first, every mass should still look quite flat, with no details. I scan the large masses again and pay special attention to the color temperature. The table top is cooler, so I add a mixture of white and sap green to it. There is violet in the green background, so I add that into the apple to indicate the form shadow. Every color I mix still has to correspond to the tone of the large mass--not much differentiation. I scan subsections of the large masses and compare them with the adjacent color masses constantly. If one passage seems greener, then I add green (plus white—if needed to match the tone). I see some pink in the yellow ground, so I add that to adjust the tone. This is the stage where the gradual tonal transitions in large masses are added. Once the large masses have 2, 3, or 4 color variations, the painting starts to have a little depth. Now comes the fun part of the process: add even more color variations within each large and small mass. I also allow the edges to get closer to each other. I hold the knife at different angles to make sharp or soft edges. At this stage, I can it quits or keep going as long as I like. My paint is getting thicker, which makes it harder to put more on top. All the major masses have the right color variations with the right tones in them. My painting says what I want it to say. 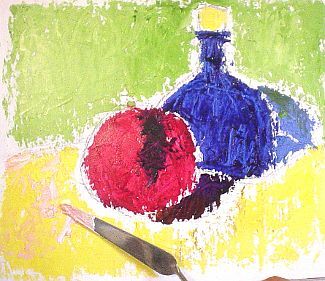 Using an impasto approach, I load the knife with a lot of paint at the tip and lightly dab it onto one more spot. Done! Later, I compared this finished painting with similar one that I did last year using a traditional scumbling and glazing approach. Even though the tonal painting has a lot of bright colors in it, they look much less radiant than the new “full-color seeing” work. I'm sold on Susan Sarback's approach on how to mix colors. 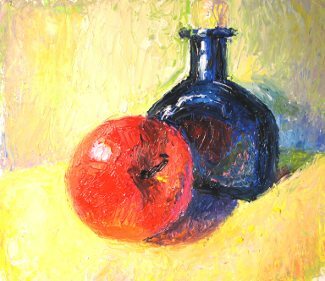 If you want to supercharge your colors and learn how to mix colors like the Impressionists, you should study the “full-color seeing” method too. It is a whole new way to perceive and paint colors. Maybe this will change your approach to art the same way it has for me. Discover oil painting techniques and materials.